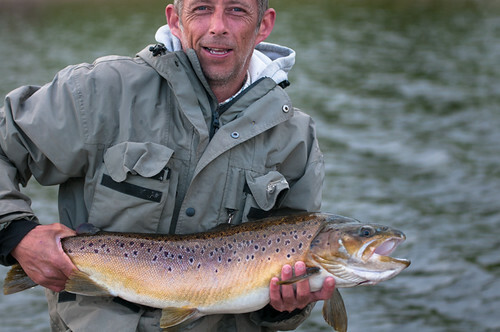 Sport: The recently flooded margins continue to produce the trout with boat anglers casting towards the shore faring much better than those fishing in deeper open water and bank anglers casting along the edge as opposed to out in front doing likewise. Dark colored patterns are still working best with black, black and green and drab olive far out scoring the more garish orange and pink. On Saturday we held the annual Stocks and shares competition in which both anglers and the fishery contributed to the prize pot which totalled £180. With the 13 anglers landing 37 trout each trout caught was worth £5 so each fish was worth catching. The best bag of 3 fish weighing 6lb 8oz went to Peter Crowe who won a greys fly line of his choice. The prize for the biggest trout went to Derek Moore with a rainbow weighing 2lb 10 oz with Derek choosing a trendy greys t shirt as his prize. Landing 6 trout and a £30 share of the prize was Neil Heath who found his fish around the saddle and the willows on the east bank and also landing 6 fish for a £30 share was Bob Fitzpatrick who caught his fish on a team of cormorants along the northern shallows and willow peninsular. Saw a big trout in the margins next to the jetty this morning making quite a commotion, this fish was on the feed with my guess being the trout was grubbing around the bottom turning over stones hunting out bullheads and stone loach which i have seen before. It is that time of year so a fry pattern would be worth a try. Syotw Paul. This entry was posted in Stocks Reservoir Fishing Reports on September 25, 2018 by staff.